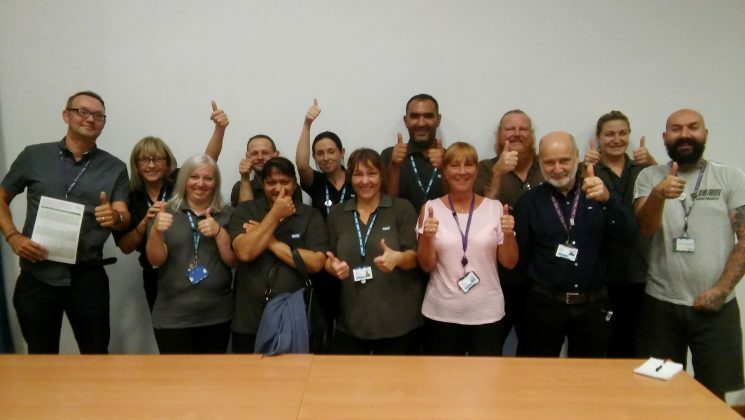 Hospital cleaners in Basildon are celebrating after winning their battle for a pay rise with the help of UNISON. The low-paid domestic staff at Basildon University Hospital had been on the minimum wage after being transferred back into the NHS from private contractor OCS two years ago. But following pressure from UNISON, the cleaners have won a 3% pay rise, backdated to April, and they will all be put back on full NHS contracts in December. This will give the 300 staff the same pay as other directly employed hospital cleaners, as well as the same holiday, sick pay and unsocial hours payments as their co-workers at the hospital. UNISON regional organiser Sam Older (pictured above, on the left) praised Basildon and Thurrock University Hospitals Trust for “doing the right thing” after two years of union campaigning. “This is great news for the hundreds of domestic workers unfairly denied a decent wage despite being directly employed by the NHS,” he said. “This agreement doesn’t just mean more money in the pockets of these hard-working staff – who are absolutely vital to maintaining a safe and clean hospital environment – the sick pay means they won’t be forced to come into work when they’re unwell. Mr Older paid particular credit to workplace rep Dave Nicholls (pictured, far right) and branch secretary Dave Burton (pictured second from the right, at the front), and he noted that organising at the hospital has benefited and that membership has gone up as a direct result of the union’s campaign over the pay inequality.